On Wednesday, November 29th I drove out to Charlottesville, Virginia’s delightfully charming Jefferson Theatre to see the first concert of the most recent leg of the Richard Thompson Electric Trio’s U.S. tour. It was the first time I’d seen Thompson in person since 1999, and my amazing wife had bought me a front row “VIP” ticket guaranteeing that I would have an unobstructed view of the proceedings (as well as a cool autographed concert poster, a tote bag, and a laminated pass). It’s not an exaggeration when I say that this concert was the best rock concert I’ve ever attended, and I strongly urge you to try to catch the show if it comes through your town. I’ve been aware of RT since the early ’80’s, (usually in the context of comparisons with Mark Knopfler, or discussions of his album “Shoot Out The Lights“, considered by many to be the best breakup album of all time) but only became a fan of his in 1991 with the release of Rumor and Sigh. I was in my final year at Hampshire College that year, and remember songs from the album being played on my favorite radio station, WRSI all the time. When I went to Purdue University for graduate school a friend of mine was a huge Thompson fan (I remember listening to live tracks with him, and was super impressed when he did an RT song live at a local pizza parlor in West Lafayette, Indiana). In fact, this review is for you, Bill Bettler! Since those early days I have acquired virtually every recording Thompson has issued and while I do not ever like to participate in “who’s your favorite musician?/what’s your favorite song?” discussions (music isn’t a competition) there is no doubt that if I could only ever listen to one musician’s output for the rest of my life RT would be on the short list of people I would consider–his versatility as a world class guitarist (electric and acoustic), a magnificent songwriter with mastery of humor, sorrow and traditional forms of songs (though often with modern topics) is nearly unmatched and his 50+ years of recordings means I won’t have a shortage of material to listen to. Adrian Belew–one of my all-time favorites, an endlessly inventive guitarist, talented songwriter and good singer. Belew is equally good at challenging soundscapes where his guitar mimics animal sounds and Beatles-esque pastiches ( a concept I learned about from Bettler back at Purdue). His output has slowed over the years, and is not what one would call “accessible”. Lindsay Buckingham–recently fired from Fleetwood Mac, Buckingham has a new solo record out, and put out an album with Christine McVie last year. He still makes good music, but overwhelmingly his focus is on his “classic” output. Billy Joel–Joel still does regular sold out concerts at Madison Square Garden in New York, and tours occasionally, but has said that he does not expect to put out any more new music. Mark Knopfler–a Scots-English fingerstyle guitarist and songwriter is perhaps the closest to RT (comparisons to whom dogged him throughout Dire Straits’ rise to fame in the ’80s), though he has achieved much more fame and record sales. Knopfler continues to tour and puts out new albums on a regular basis (he’ll be in Virginia around my birthday and I might try to go). Nick Lowe–a talented songwriter and producer, he hasn’t had a new record for quite some time. Bonnie Raitt— a great guitarist, singer and interpreter of songs (who has recorded more than one song by RT), Raitt’s last album was quite good, but it’s a couple years old now. Lionel Ritchie— a singer and songwriter of many classics, he hasn’t put out anything new for many years. Paul Shaffer— member of the Blues Brothers, Artie Fufkin in This is Spinal Tap, bandleader for David Letterman and the Rock and Roll Hall of Fame. Paul is an interpreter and sideman, not a truly creative artist. Rick Springfield–a surprisingly prolific songwriter and energetic, talented performer with a great life’s story (moving from Australia to California to become a rock star, who then became a soap opera star, only to return to music). He continues to record, and his latest album is quite good. Bruce Springsteen–one of America’s greatest songwriters, an unparalleled showman and bandleader now completing a year-long one-man show on Broadway. Rumors abound that he is ready to take the E Street Band back into the studio for something new, but I don’t think that even his most devout fans can find more than a couple of songs in his output over the past 10-12 years that match what he wrote when he was younger. Rick Wakeman— still traveling the world playing his music with Yes (or Anderson Rabin Wakeman). He’s recorded scores of albums, but is known more for his capes than his songs, I think. Honestly, I think that of this list, Thompson holds his own with Springsteen and Knopfler, and at some level I applaud his hard work even more–it feels like he keeps writing and performing because he has to, rather than out of choice, or to buy a new horse or recording studio, which perhaps help him maintain his high standards. Regardless, I think it is remarkable that his latest album, 13 Rivers is one of the best he’s made; to still be so creative at such a high level so long into a career is definitely uncommon and should be appreciated. The Richard Thompson Electric Trio consists of RT on guitar and lead vocals, Taras Prodaniuk on bass and harmony vocals, Michael Jerome on drums and harmony vocals, and Bobby Eichorn on rhythm guitar. That’s right, it is a “Trio and a Half”; Eichorn is Thompson’s longtime road manager and guitar tech who chips in on a few songs. For the gearheads out there, Thompson played the coral pink Strat that Eichorn assembled for him, a Telecaster shaped electric 12 string and his Lowden acoustic, while Prodaniuk played a couple of Fender Precision basses. Eichorn played the sonic blue Strat he built for RT or Thompson’s Lowden. For what it’s worth, the sound of Thompson’s Strat through his Divided by 13 amplifier (nearly always on the bridge/middle position, with occasional forays to bridge or neck) was the quintessential Strat tone that people buy those guitars for. Very inspirational! The band has been together for quite a long time–well over a decade, and the on-stage chemistry and communication was something to see. I mentioned above that this was the best rock concert I’ve been to, and a big reason for that was how purely rock it was–just guitar, bass and drums (I’ve been to a lot of great concerts, but often these bands have horns, or keyboards, or multiple guitarists to flesh out the sound). This band was so tight! Prodaniuk’s basslines were simple, but endlessly varied and always mellow and soulful; that said, when needed he took over and drove the band with a solid rock sound. Michael Jerome’s drumming was outstanding–he seemed to have so much fun, and was locked in to the other two with seemingly telepathic connections. He also provided very nice background vocals. Of course, the star is Thompson, who stood in black jeans, a black WNRN (the local independent radio station) shirt covered by a denim vest and his trademark black beret striking a classic, guitar-god power stance at the microphone, singing powerful vocals and delivering blistering solo after blistering solo that showed no end of creativity and expressiveness. I’ve been playing guitar seriously for over 32 years and if I play for another 32 I doubt I’ll ever be able to do half of what RT did on Wednesday night. 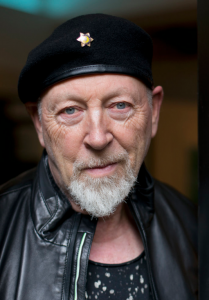 I’ve read musicians talking about how they hope once or twice per show to “get in the zone” where they become one with their instrument–it seemed like Richard Thompson got there a dozen times and it was amazing. Several times I just found myself laughing out loud in joy and amazement at what his fingers were doing on his guitar. The show lasted for just about two hours (following a short opening solo set from folk singer Joan Shelley. The setlist was a mix of new songs and classics; it was heavily weighted to tunes from records he’s put out in the 21st century and it shows how devoted his fans are that these songs were received as enthusiastically as classics from the ’60s and ’70s. Also impressive was how the songs were stretched out–I noted the start and stop times for every one, and most of the songs were much longer than the album versions to make room for guitar solos, bass solos, and other improvisation. Richard Thompson shows are known for, among other things, fans shouting out requests and places where he encourages them to sing along. I usually don’t like either of these things, and Thompson was caustic in response to some of the shouts from the audience; when a woman repeatedly screamed “I love you!”, he sneered “what do you know of love?” (but then collapsed in giggles), and when a fan called out for the song “Calvary Cross”, RT said, “well, maybe if we have time. But I’d have to teach it to the band first.” That seemed to put a stop to that aspect of the show. But I have to say, when he encouraged us to sing along to “Meet on the Ledge”, I couldn’t help myself and sang like I do when I’m driving alone in the car–loud, uninhibited, and desperately flat! In case you are new to Richard Thompson, I’ve attached a playlist of all of the songs he played on Wednesday for you to check out. And seriously, if the Richard Thompson Electric Trio is in your town (or 70 miles away, like they were for me), do yourself a favor and go check them out. I don’t think you will be disappointed in the least.